Hey folks, I think we have everything about ready for Fri. and Sat. – just hope the weather is good. This is our 3rd annual Vets Fly Fishing Event with great and free BBQ and outstanding fishing at Nacoochee Bend. We will meet in the big field below the bridge going in to Helen between 10:30 and 11 AM on Fri. for lunch and fishing and we will start our fly tying event on Sat. 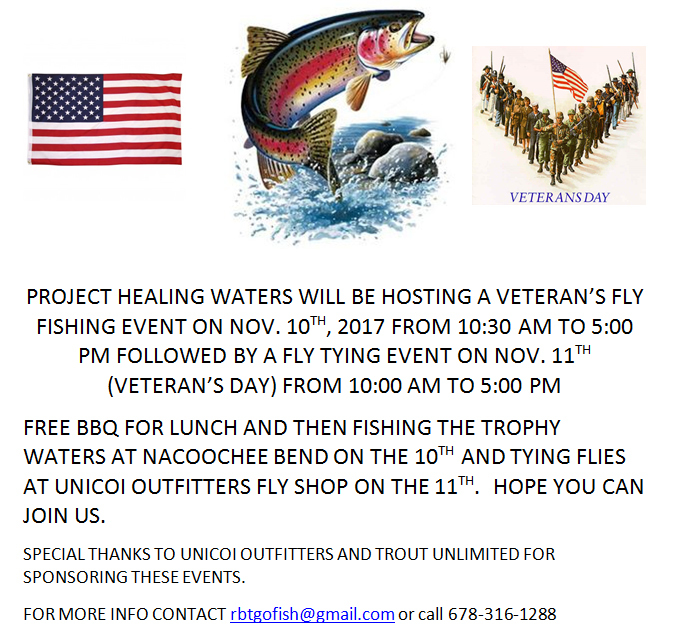 around 10 AM at Unicoi Outfitters Fly Shop – bring your vise and tools to this. This is our Main Event of the year and I hope most of our guys will be there – it’s going to be a blast! We will have a couple of guided trips to give away and more good stuff that will be available. We will have Vets from Atlanta, Augusta, and Blue Ridge and from different parts of South Carolina. If the parking lot is filled on Sat. at the shop, don’t park in front of the real estate office. You can park across the street behind the restaurants or you can also park in the Habersham Winery parking lot, walk across the street to Nora Mills and walk up the road to Unicoi Outfitters – if everything else is filled. Don’t park at Nora Mills or Jumping Goat Coffee Shop. This event was great last year, and we hope it will be even better this time around. We have put a lot of hard work in preparing for this weekend and so have the folks at Unicoi Outfitters. We will have the field roped off for parking on Fri. – we cannot park in the middle of the field. We need another pop-up shelter or canopy for Fri. if anybody can bring one – not real big and we need to have it there in time to set up before we start. Be sure to bring your Ga. Fishing license and trout stamp and expect a great day!! I am attaching the info about our event. If you have questions, email me or call me at 678-316-1288. Thanks to everyone who helped stock fish last week – it was awesome – and thanks to all you guys for helping make our group special.